I've seen this issue on a couple of games lately. The 5v power supply is near or exceeds 5v in both cases. 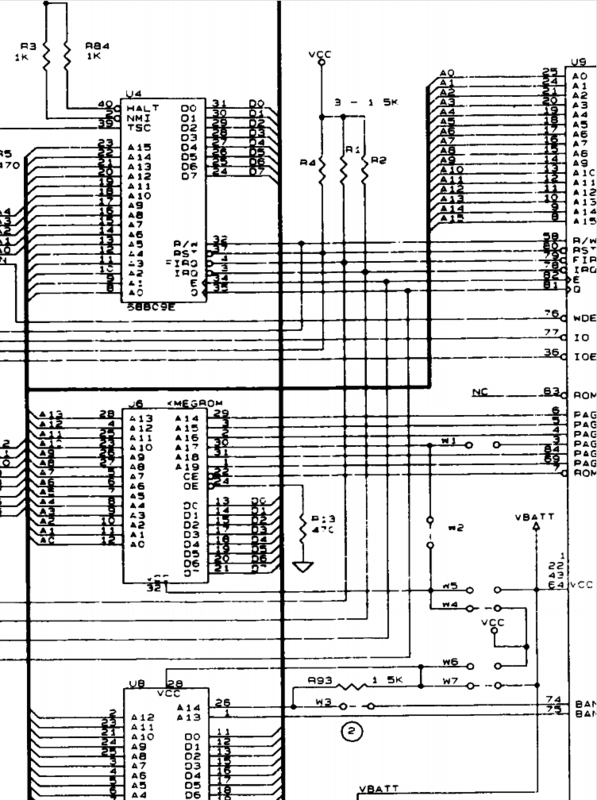 For whatever reason I'm getting a 200mv+ drop between the CPU board's 5v input connector and the game ROM. Both games are resetting frequently. I've never seen anything like this, usually it's at the driver board itself or the connectors going to the CPU board. The only cap I see measures 5.05v across and I also reseated the ROM with no improvement (WH20). Could the ROM socket possibly be the culprit? I am aware they cause all sorts of issues at times due to their design. Or could the issue be more difficult to track down/repair? If the latter is true then I will simply opt for the cheaper and more stable WPC 5v mod. I would just track the power from point to new see where you drop and then triage from there. Truly follow the schematic and measure from point to point across the circuit. The above appear to be test points on one side of a zero-ohm jumper at each location. I tested these jumpers and there is no drop across them. I moved the game ROM and batteries over from the old board. Suspecting a battery problem, the VBATT side of W5 reads 4.11v when the game is off. The batteries need to be changed, but I don't see anything odd with those and the game is currently keeping memory. However, I did notice something strange with the 1.5k resistor at R3. One side reads 5.04v, but the other reads 4.97v. For comparison I tested across R96 and R97 near the top of the board and got only a 10mv drop across them, even though they are both 1.5k as well. I am pointing to the low side of the resistor in the second photo. Is this normal? How is the power foing to the games? I'm getting a steady 119v at the wall outlet. This is the only machine resetting, but it doesn't seem to be an issue apart from the CPU board as the voltage coming in at J210 is a healthy 5.06v. 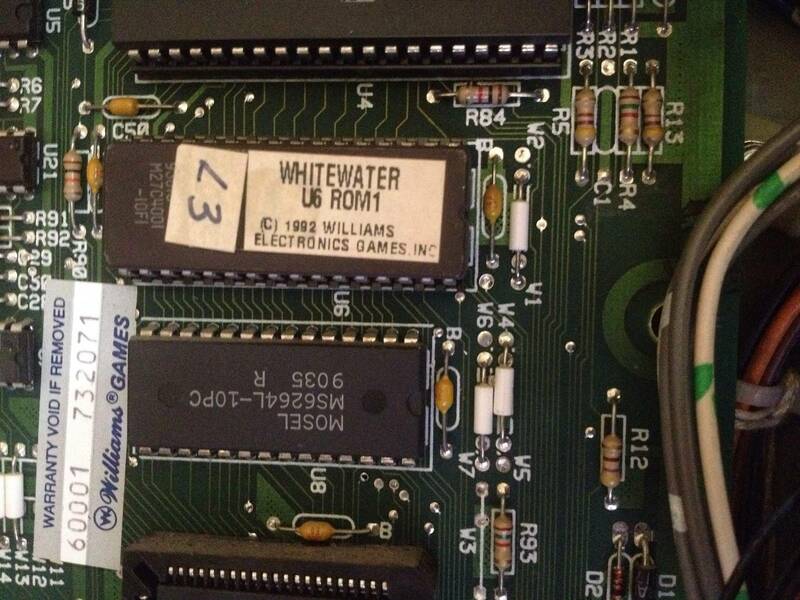 I'm also considering a possible issue with the game ROM... that's the only other thing I carried over from the old board. Any ideas? Do I just need to send it to Clive? I have two boards doing this and don't want to spend money having them both repaired if it's something simple. I usually come into threads like this hoping that I know something that can help the OP, but you've got me here. Knowledgeable people never ask easy questions! Yeah I'm in the dark as much as you are here. Again, I'm thinking it may be a chip on that board dragging the voltage down but the game ROM is the only one I see with a vcc input. And if that's the case I will send it off anyway. I will try the original board in another working machine and see if the problem follows. Rob Kahr's daughterboards (http://kahr.us/) have been my first go-to when I run into this type of reset. Both times I've run into random resets, the board solved it & it's only $28 and doesn't require any work other than unplugging a cable & plugging it into the daughterboard. Just a thought anyway, it's a small investment & can't hurt. So that 200mv drop to the ROM is normal. Next I'll be investigating the driver board. Thanks for the help. First, move the batteries off that CPU board. Since I have already replaced the caps and regulator on the driver board and the issue is not connections between boards (5.06v coming in) I opted for Kahr's board. Now I am getting 5.15v to the CPU and 4.91v at the game ROM. No more resets! The reset is caused by a watchdog circuit. The watchdog circuit is probably on the other side of the that resistor, so the voltage at the ROMs shouldnt be a major concern when finding a reset reason. 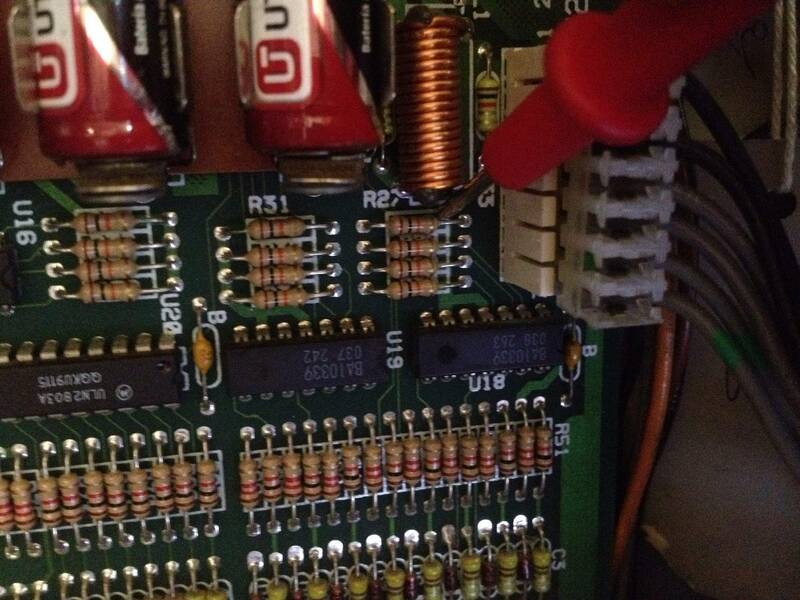 If you have good +5v on the input pin, but it still resets, there is something going on. Failing filter cap could not hold the charge during a current spike (flippers). Resistance on the connector plugs. Etc..(see Chris's link). Scope would let you watch the power when the flippers are going off. Glad you fixed it with the Kahr board, but the tech inside me think that is a bandaid and your power supply still has problems. But if it works, it works! Hard to argue to mess with the board when you have it working. Well of course, that's the first approach I took. The first thing I did was replace key components and that worked great for a few years. Then it started acting up again, and it was just the MPU board resetting (which is the main drag on the 5v power supply). If it were my game I would go through the machine 100% but as operators we don't have the time. The game is a high location earner. The funny thing is I tested voltages as low as 4.79 on another game and that one does not reset at all. Another thing, a lousy capacitor job at C5 on the driver board will provide good readings but will not stand up to gameplay. What I did after re-pouring solder joints on all that makes up the 5V digital it was still resetting. I try my best to not make jumpers on the back of a board but if I ruined the wells on C5 there was little choice so after jumpering the resets went away. While the 4.79 might be enough to keep the watchdog circuit happy. When the flippers go off you are depending on a capacitor to act as storage tank to keep the voltage up. If you deplete the capacitor in the time of a flipper pulse the voltage dips and the watchdog triggers a reset. This happens so quick, a DMM may not see the voltage drop. Poor physical connections add resistance too. I changed it already, as a lot of people suggest. You changed the bridge? Did you buzz for continuity on both sides of the board after replacement. Those traces on both sides of the board can be tricky. Yes. I had to run a jumper afterwards for C5. Like he said, it's a location machine. It can't be down for 3 days to do what we'd like to do to fix it once and for all (20 more years)! I end up finding on a lot of games having either loose or burnt female pins on J101 being the most common to cause resets.